I'm not intending to write a spoiler, but if you're like me where watching a trailer can be too much info, just stop reading. It's OK.
Alright, with that over with, on to my thoughts. 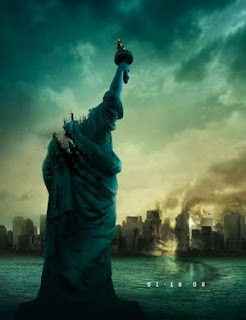 Well, Jessi and I saw Cloverfield last night with a friend. My first observation was about the demographics inside the theater. I don't think there was anyone older than 30 and Jessi was one of three or four girls out of 100ish - and they all sat alone with another guy. After the movie, I think the right people saw it: There is a lot of shaking, action, not much dialog, and is over just as fast as it starts. I'm sure it'll make a perfect video game someday. The biggest deal was the end. I won't say there was ZERO closure, but let's just say I left wanting more of an explanation. The first person narrative is cool, but it's obvious there's a back story going on and we don't learn any of it. If you're OK with that, enjoy. Think of it this way, the movie is about the characters and their struggles - NOT about the events taking place. In that sense, the movie ended really well. Unfortunately, we've all gotten used to movies like Titanic which is obviously about a single couple, but the movie goes above and beyond to explain everything else. Jessi did have a good idea once we got out. She suggested they make a sequel picking up where the film ended and treating it like a "normal" movie. In other words, explain everything. From a business standpoint I loved this idea. They have a bunch of people asking questions and looking for a resolution. If they can put a cool twist on the story, I think they could easily make a lot of money again, and make everyone happy. AND make a lot more money. Oh, just in case you have seen the movie and are looking for just a little more closure, J. J. Abrams has a blog about it. I specifically like his cloverfield production notes, but the whole site helps to fill in the story. See, that wasn't too bad of a spoiler.